the tour went well. I liked everything, the Guide was cheerful, the buses are very convenient, but we didn’t have time to get around just an hour. Back sailed on a boat to the city, very much. We were satisfied with the tour. 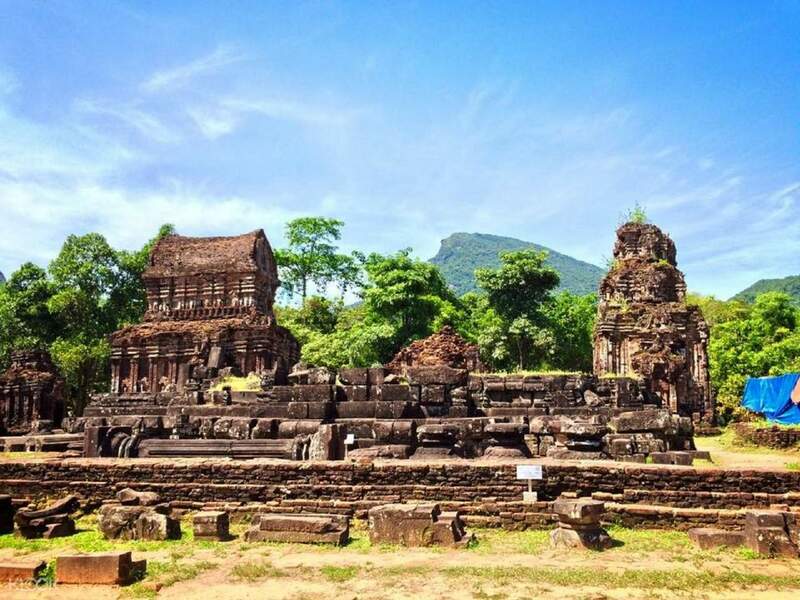 Lovers of architecture and ancient civilizations will not regret a day tour to the South of Vietnam to visit the My Son Hindu Sanctuary, a cluster of partially ruined temples that have long been abandoned, though once a thriving religious site of the early Champa tribe. Recognized as a UNESCO World Heritage Site, the sanctuary features stone sculptures of Hindu deities and towers amid the tropical jungle. History buffs and furniture enthusiasts would also not want to miss the second stop of this day tour - a trip to the Kim Bong Carpentry Village via boat, a traditional yet lively village that boasts of unique carpentry styles and quality products that you could take home as souvenirs! Accompanied by a local English speaking guide, you're sure to discover much about both old and existing communities that play important roles in the development of the country. Enjoy a light lunch as you cruise back to the Nguyen Hoang Pier, from where you can continue the rest of your day's itinerary as you please. the tour went well. I liked everything, the Guide was cheerful, the buses are very convenient, but we didn’t have time to get around just an hour. Back sailed on a boat to the city, very much. We were satisfied with the tour. the tour went well. I liked everything, the Guide was cheerful, the buses are very convenient, but we didn’t have time to get around just an hour. Back sailed on a boat to the city, very much. We were satisfied with the tour. Our Mr. Tour Guide was funny with his English accent. Trying hard to understand his English but its ok...not too bad. He's informative too. My Son was hot. We walked thr for ard 2.5hrs before we go to a pier to board a boat. We had our simple vegetarian lunch on the boat. Drinks not included so have to buy for 20000vnd. Our Mr. Tour Guide was funny with his English accent. Trying hard to understand his English but its ok...not too bad. He's informative too. My Son was hot. We walked thr for ard 2.5hrs before we go to a pier to board a boat. We had our simple vegetarian lunch on the boat. Drinks not included so have to buy for 20000vnd. Very knowledgeable and humorous tour guide (he deserves so much more attention and credits). The bus came at their Tour Office, promptly explained where and how much and procedures. Going into My Son was easy and hassle free. Whilst on the way back, a detour to a little village opposite the An Hoi was lovely. Even though it might seems like a tourist trap but you were able to find some local gems. Highly recommended it but do not book anything in that early afternoon as it can eat into 1300 or 1400. Very knowledgeable and humorous tour guide (he deserves so much more attention and credits). The bus came at their Tour Office, promptly explained where and how much and procedures. Going into My Son was easy and hassle free. Whilst on the way back, a detour to a little village opposite the An Hoi was lovely. Even though it might seems like a tourist trap but you were able to find some local gems. Highly recommended it but do not book anything in that early afternoon as it can eat into 1300 or 1400. My Son was very interesting and our tour guide was very informative. The bus ride was comfortable but full. The boat ride was enjoyable, peaceful, and serene. The lunch was as described - it was filling and adequate. My Son was very interesting and our tour guide was very informative. The bus ride was comfortable but full. The boat ride was enjoyable, peaceful, and serene. The lunch was as described - it was filling and adequate. Very good. Our guide , Tin was very informative. The boat ride and lunch after Mi Son was a real treat as well. Very good. Our guide , Tin was very informative. The boat ride and lunch after Mi Son was a real treat as well. Review for 31 Aug 2018 - Like what other reviewers have mentioned, we were first picked up by a van and then joined another bigger bus. After collecting all passengers we set off for My Son. It was scorching hot when we were touring around the site but our guide Tin was patient and gave us information on the place. We were also allowed time to take photos but since there were groups of visitors it would be hard if you want decent photos. It did not bother us though. We saw the different groups of temples/ruins and had a little time for the museum as well. Transfer back to Hoi An by boat was nice (no one in the group wanted to visit the carpentry village so could not comment) and the light lunch was fine with us. It was worth the price. Review for 31 Aug 2018 - Like what other reviewers have mentioned, we were first picked up by a van and then joined another bigger bus. After collecting all passengers we set off for My Son. It was scorching hot when we were touring around the site but our guide Tin was patient and gave us information on the place. We were also allowed time to take photos but since there were groups of visitors it would be hard if you want decent photos. It did not bother us though. We saw the different groups of temples/ruins and had a little time for the museum as well. Transfer back to Hoi An by boat was nice (no one in the group wanted to visit the carpentry village so could not comment) and the light lunch was fine with us. It was worth the price. it was a nice tour. our guide is friendly and funny. the tour on time, and my son is worth to visit. our light lunch on boat is a simple noodle dish, adjusted to our preference (i can't eat pork). it was a nice tour. our guide is friendly and funny. the tour on time, and my son is worth to visit. our light lunch on boat is a simple noodle dish, adjusted to our preference (i can't eat pork). Organized, timely and efficient tour. Tour guide was friendly, managed time well, and also shared lots of interesting history about the ruins and temples. The place was magical, like an excerpt from an adventure game. Highly recommended if you have half a day to spare. Organized, timely and efficient tour. Tour guide was friendly, managed time well, and also shared lots of interesting history about the ruins and temples. The place was magical, like an excerpt from an adventure game. Highly recommended if you have half a day to spare. Mr. Van was a nice person that took care of every passenger for photo shooting at My Son ancient ruins though the weather was bad at that time. Unfortunately, due to the bad weather condition, the sculpture tour was cancelled and we didn't receive any compensation about that. The light lunch on the boat was delicious. In average, I will recommend this small local tour for any backpackers who has short stay in Hoi An. Mr. Van was a nice person that took care of every passenger for photo shooting at My Son ancient ruins though the weather was bad at that time. Unfortunately, due to the bad weather condition, the sculpture tour was cancelled and we didn't receive any compensation about that. The light lunch on the boat was delicious. In average, I will recommend this small local tour for any backpackers who has short stay in Hoi An.